Displays the research function in the browser or hides it, respectively. If the research function is hidden, only the results table is shown. Predefines the maximum amount of characters that should be shown for each data record in the column. Defines the maximum number of data records that should be shown on a page in the browser. If -1 is entered here, all records will be displayed. If this is selected, a text will be displayed when there is no data available. With this setting, the text used will be the one stored in the language constant "DR_NO_RECORD", it will also be displayed multilingually according to the regional settings of the portal properties. If the setting "Use global text" is not activated, a static text can be entered in the entry field below or you can select a language constant that will provide the text. Displays the "Email" button link beneath the results table. Select a data field that contains the email addresses. When the user clicks on the link in the browser, a new window opens with an edit form. The email can be sent in text or HTML format. A static sender address can be entered here. A static subject can be entered here. Enter the text for the email here. The data field that contains the email addresses can be selected here. The field selected here is used as a placeholder in the email's text field, this consists of the field name and the field's GUID. 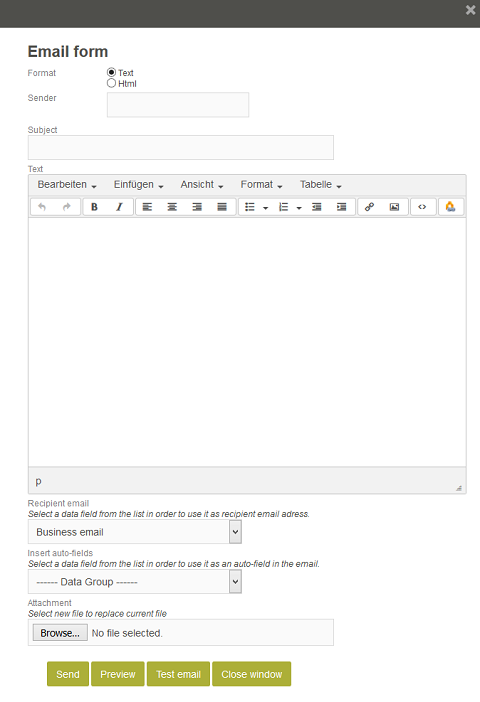 In the email, the corresponding value will be used instead of the placeholder (e.g. the personal letter salutation). Click on "Browse" here to add an attachment. 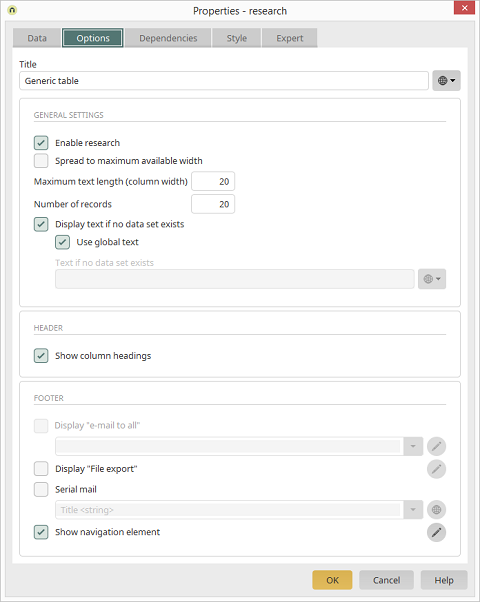 By clicking on "Send", an email is sent to every email address from the Research element. Click on "Preview" to view the email in another window. By clicking on "Test email", an email address of your choice can be entered in the window that opens. A test email with the defined content will be sent to this address.